Splashing in the pool is one activity my girls look forward to every summer. They can't wait to jump in the pool and swim with friends. This year, I reflected on why my girls love to swim. I think they would say that it's fun, and I agree, but there are also seven important reasons why every child should know how to swim. According to the Centers for Disease Control and Prevention, drowning is the fifth leading cause of unintentional injury death. Out of the 10 people who drown every day, two are children younger than 14 years old. It breaks my heart every time I read of a child drowning, and every penny I spend on pool admission, swim lessons, and goggles is worth it as I protect my babies! For kids with physical disabilities or certain medical conditions, traditional sports and physical activity are impossible. But they can benefit from swimming. It provides aerobic exercise, builds muscle strength and endurance, and provides relaxation. No matter what ability level your kids have, they can enjoy swimming and playing in the water. My girls are active kids, but I'm always looking for ways to challenge them physically. Swimming is a unique activity that improves their lung capacity and stamina while building upper- and lower-body strength. It's also beneficial for improving posture and flexibility. Give your kids the opportunity to improve their physical health when you encourage them to swim. Three in 10 children are at risk for developing obesity-related illnesses, including type 2 diabetes, heart disease, high blood pressure, high cholesterol, asthma, sleep disorders, and hormone imbalances. When you let your kids swim, the regular physical activity can reduce their risk of developing obesity and the illnesses that go with this health challenge. If your kids play sports like my girls do, they are likely to suffer sports-related injuries, including fractures, sprains, or concussions. Swimming can reduce their injury risk since it improves flexibility, posture, strength, coordination, and stamina. Add swimming to your child's training regimen and you equip them to be safe as they play the sports they love! 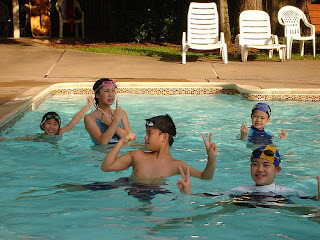 Swimming can be very competitive as kids push themselves to beat their opponents to the wall. However, I love that my girls can simply swim to learn new skills. For example, my older daughter perfected her dive, and my younger daughter learned the backstroke last year. That skill improvement gave them a huge self-esteem boost, and I love it because they can customize their competition based on their interests. Whether you're one or 101, you can enjoy swimming. It's a low-intensity cardio activity that's easy on the joints, fun to enjoy, and impossible to outgrow. Now that my girls know how to swim and feel comfortable and confident in the water, I know they'll be able to enjoy swimming and its benefits for the rest of their lives. Do your children enjoy swimming? Teach them this valuable skill this summer. They're never too young to learn, and they will gain these seven benefits and many more.